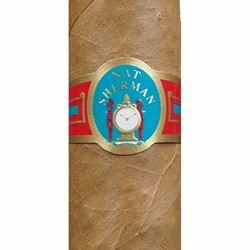 Nat Sherman Metropolitan Host Selection is an old-school cigar from one of the world's most famous old-school tobacconists. Indeed, Nat Sherman opened its doors in 1930, originally located on Broadway in Manhattan (today residing on E. 42nd St.). While the company has sold its own brands of premium cigars since the very beginning, the Metropolitan Host Selection was known to be a personal favorite for Nat Sherman himself. Differing from the Dominican and Nicaraguan origins of nearly all Nat Sherman cigars, the Metropolitan Host Selection is special in that it is hand-rolled at the famed Camacho factory (Diadema Cigars de Honduras, S.A.) in Danlí, Honduras. Metropolitan Host Selection is built from an all-Honduran filler/binder recipe and topped with a silky smooth Connecticut Shade wrapper. This makes for delicate and refined smoking experience, backed by a goodly amount of flavor from the hearty Honduran leaves. Smokers can expect a smooth, mild, and refreshing profile, offering flavors of sweet nuts, honey, green tea, buttered crackers, and mouth-watering citrus.